Happy last week of August everyone! Boy does time fly! For this week's #Gravi-Member Spotlight we are featuring Mackenzie Nading, the Executive Director for the Iowa Wholesale Beer Distributors Association! Keep reading to find out what exactly her position entails and of course, learn some fun facts about this spectacular Gravitater! To give you a little more detail about the Iowa Wholesale Beer Distributors Association and Mackenzie's role there, the Association is comprised of 19 independent Iowa Beer wholesalers covering territories that serve all 99 Iowa counties. As Executive Director Mackenzie wears many hats, a lot in the association management realm such as collecting dues and managing a budget, public relations and member relations! Her primary duty is helping the members of her team navigate state laws and regulations and ensuring they comply with all of the laws that affect the beer wholesaling industry. Another fun thing Mackenzie gets to do during the months of January through May/June is take part in the Iowa Legislative Session - lobbying legislators on laws that affect the beer and alcohol industry at the State Capital! How cool?! You may be asking yourself, "Wow what a position Mackenzie!" Mackenzie first found her passion for politics right after college while working as a clerk for a representative during the 2015 legislative session. Since then she has always found herself pursuing careers that are linked to the state legislative process, usually in a research or lobbying capacity. "Now I get to combine my love of politics with the world of beer, and as you can imagine there aren't many boring days on the job!" Working as a "one-woman shop" Mackenzie was skeptical about working alone. Spoiler alert...she hated it! She then began the hunt for a work space that she could share with others without necessarily doing the same work. That's when a friend pointed her to Gravitate and she has been hooked ever since! "I love learning about all the different careers that exist in this office space. All of my past work experience has been on the bureaucratic side, so learning more about startups and seeing the collaboration happen within this work space to help each other succeed is extremely addicting. Even though my job doesn't really reflect that of anyone else's, I feed off the energy put out by all the diverse and hardworking individuals here." We all definitely feed off of the energy put out in this entrepreneurial space and love that our members feel it too! 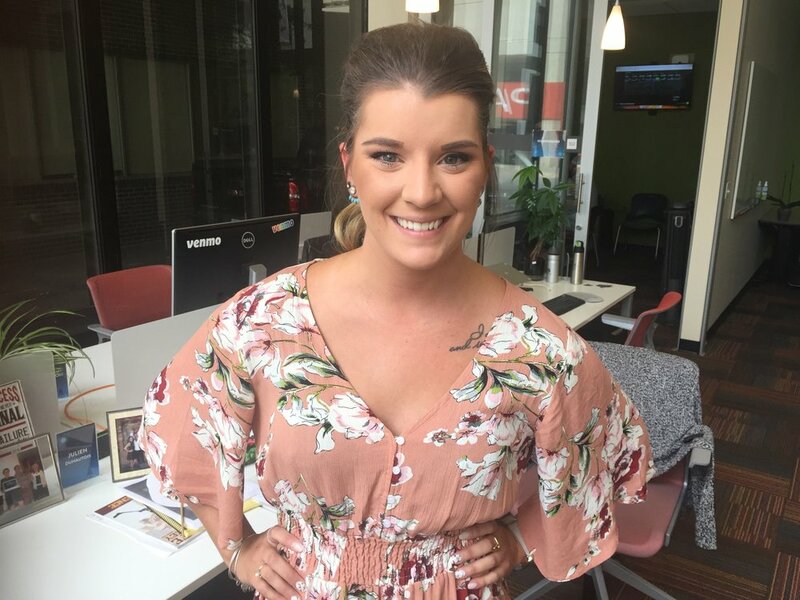 - Aside from politics, Mackenzie is passionate about black coffee, any dog she comes in contact with (shoutout to Herc for being her favorite coworker), Iowa State Cyclones, Minnesota Vikings, tattoos, and Harry Potter! - Her favorite place in Des Moines is the Animal Rescue League (which is technically in Ankeny hehe)! She loves spending time with all of the rescue animals and supporting the resources to help them find homes! - The best concert Mackenzie has ever attended was Ed Sheeran. Ed is one of her favorite artists, but he is known to put on the best live shows and Mackenzie can definitely attest to it. In her words, "The only music comes from his guitar, a loop pedal, and his own voice. It's an unreal experience!" - The fun fact Mackenzie is most proud of is that she has met Michelle Obama...wait...I should rephrase that...Michelle Obama pulled Mackenzie's hair. Yup. Mackenzie welcomes you to stop by her desk to hear the full story anytime! You bet I will be!